Pancho Campo, president of the Wine Academy of Spain, presided over the conference, with Al Gore on a video feed. During his closing speech at last weekend's World Meeting on Climate Change & Wine 2008, held in Barcelona, former U.S. vice president Al Gore lauded the wine industry for being at the forefront of positive changes that benefit the earth. 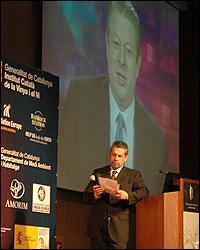 Gore won a Nobel Prize in 2007 for his efforts to draw the world's attention to the problem of global climate change. Gore, who delivered his remarks via video conferencing from Nashville, Tenn., said that greener packaging for wine, which some producers have adopted, is a step in the right direction, and that vintners should continue to follow their political, ecological, ethical and economic responsibilities. Gore was also pleased that the wine industry is giving global warming attention, which is not the case with all agricultural industries. "Things we measure get more attention than the things we don't measure. So CO2 has historically been treated as irrelevant," Gore said in his speech, titled, "An Uncomfortable Truth." Ryan Opaz, owner of a fledgling Iberian wine-marketing firm called Catavino, said he was impressed that Gore's speech was not the "standard stump speech," but felt that some members of the wine industry still seem uninterested in the effect of global warming on vineyards. Opaz said that in the tasting area he asked a few wineries, "So what are you doing here?" to which many replied, according to Opaz, "I'm just here to pour some wine." Although representatives from the wine industries of 36 countries were present, event organizer Pancho Campo, president of the Wine Academy of Spain, complained of the lack of interest from Spanish winemakers. "The only Spanish winemaker here today is Bodegas Torres and the P.D.O. Condado de Huelva," said Campo. "But nobody from such important winemaking regions as Rioja or Ribera del Duero." Speaking at the conference, Miguel Torres and Tony Sharley, manager of Banrock Station in Australia, discussed the amount of time, effort and money necessary to achieve sustainable and eco-friendly wine production. Both wineries catch and recycle rain water, use recycled packaging and replant trees in surrounding landscape to help offset carbon emissions and rebuild indigenous ecosystems. Some wineries in other regions are beginning to use solar and wind power, but complete conversion to renewable energy is still years away even for the most ardent embracers of green technology. Torres said that while the fermentation process of winemaking releases a great deal of carbon, 1 hectare of vines consume 6 tons of carbon per year. "I would like to [demand] that the whole world put forth a contribution," Torres said to the audience. "You as industrialists and distributors will begin to see more and more how the consumer is going to ask for products from businesses that are conscious of a climate problem."